Thank you to Hazel Watson and Surrey County Council for providing the funds to have the commemorative plaque at the village hall restored. The plaque details the building of the original hall in 1920 and the objectives that it wished to romote; recreation, intellectual improvement and haracter formation! It also explains that the seat if remembrance was erected to the memory of Lawrance Briant J.P. in 1925. 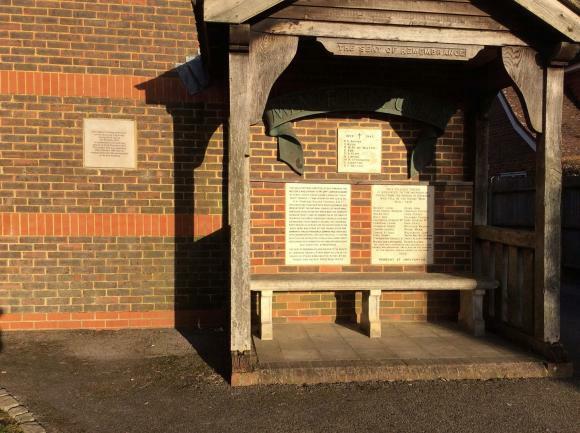 Last year the war memorial plaques were both restored and our thanks go to Deadre Cunningham for organising this through Abinger Parish Council. As you can see from the photograph it all looks very clear and legible now.